Our government agencies that are in charge of wildlife lack empathy. This is true, because how else can they justify the millions of wild animals they have removed or harvested in the name of management. Government wildlife technicians have some sort of wildlife degree that quality them to do the work. But are they expected to act with a lack of empathy in order to manage these wild animals? They view these wild animals as non-beings and refer to them as it’s for the purpose of management. It’s a cold reality and never more apparent than in today’s conservation ethic. 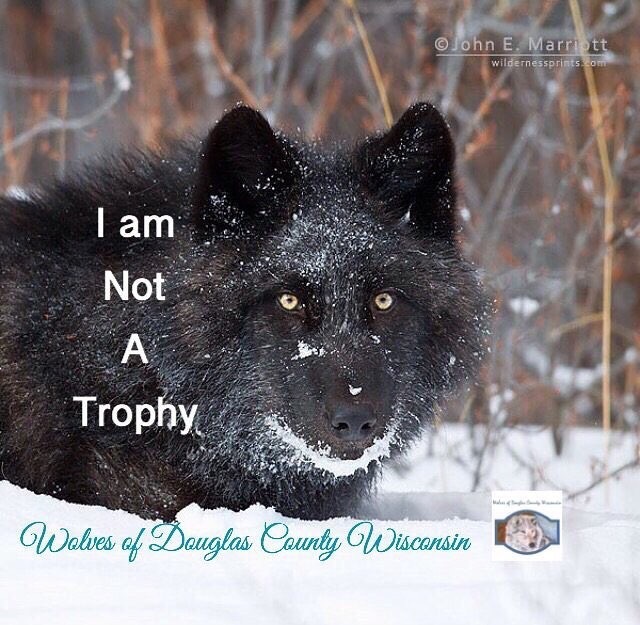 This is obvious with our WDNR allowing wolves to be chased down by large packs of free ranging dogs with out any rules, regulations and little or non existent enforcement. Wolf hounding is not only barbaric, it takes us back to a centuries old method of killing wolves; that has no place in a civilized society. In Wisconsin they quite literally throw dogs to wolves. Wolves, a once endangered species is now relegated as an it, and harvested as a game animal without any thought of them as a sentient-being with a family. Where did this cruel attitude towards wild animals start? This has been considered the norm for far too many decades and even for centuries. The land ethic is a community, that we all care about and live in. Wild animals are sentient-beings, that live within communities just like human beings do. Using the word harvest is a way to psychologically remove the emotional responsibility; for killing a living breathing being. Ethical Hunting has been used as a method to feed our families for centuries, but that has changed in today’s society. Hunting in today’s world has become recreational, for fun and entertainment. Hunting is now just something to; do out of doors, and in nature to recreate. This is all managed by our government agencies such as the Department of Natural Resources Wildlife Managements Division that; have become hardened & cold towards the lives of the creatures they are suppose to be conserving. Our government agencies go through the motions of acquiring scienctic knowledge but they lack the emotional integrity to fully apply the science. And this becomes “the heartless” anti-wildlife management we see today. 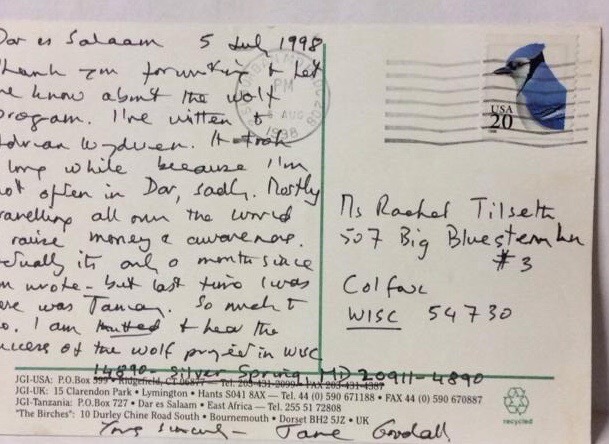 The photo is a postcard from Dr. Jane Goodall sent to me in 1998 in response to a letter I Sent to her regarding Wisconsin’s Wolf Recovery Program. Reblogging this piece from the WODCW archive. Cathy Stepp’s New WDNR: Dysfunction Junction.